The 7I30-4 is a 3A, 36V 4 channel H-bridge motor driver for the 4I27, 4I34, 4I65, 5I20 and 7I60 motion controllers. They use high efficiency synchronous rectifying drivers, eliminating the need for heat sinks. 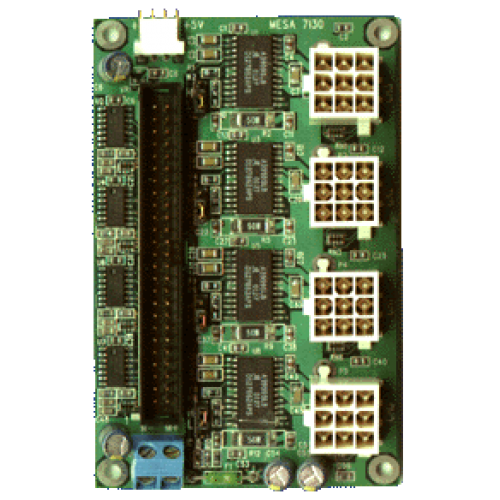 They connect to the motion controller card with a 50 conductor flat cable and have AMP Mini Mate-N-Lock connectors for motor drive and encoder/index connections. Each channel has a selectable 3A or 1A current limit and can operate in fast decay or slow decay mode. Input RC filters and Schmitt triggers are provided for encoder and index signals. The 7I30-4 is available with 50 pin male header for use with flat cable connection to 4I27, 4I34, 4I65, 4I68, 5I20, 7I60 or a 50 pin female header on the reverse side for use as a 7I60 daughter card. A 2 channel version (7I30-2) is available for use with the 4I27.